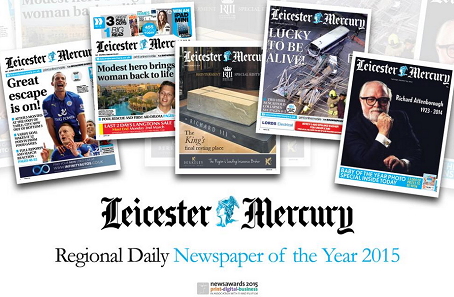 The Leicester Mercury and the Eastern Daily Press emerged as the big winners at a set of awards dedicated to excellence in print and digital production. The Mercury was named regional daily newspaper of the year at last night’s newsawards 2015, while the EDP won the Fujifilm Grand Prix award – recognising titles which have succeeded across the three areas of print, digital and business. Also competing for the best regional newspaper prize were the Cambridge News, Eastern Daily Press, Hull Daily Mail, Dundee-based The Courier, The News in Portsmouth and The Press & Journal in Aberdeen. Judges said the EDP had “brought renewed confidence to the regional press sector”, highlighting campaigns that raised hundreds of thousands of pounds for local organisations and charities. They said the EDP had “reinvented itself and is adding huge value to the community while returning excellent figures”. The title fought off competition from a number of national newspapers for the gong. The weekly newspaper of the year award was won by The Cumberland News which competed with six others for the prize. Now in their 19th year, the revamped awards have been divided into three distinct sections – print, digital and business – and the ceremony was held in London last night, hosted by comedian Al Murray. Trinity Mirror won the digital innovation category for its Newsroom 3.1 project, which has seen a ‘digital first’ publishing process introduced at its centres, with the print innovation prize going to the Newbury Weekly News for its augmented reality 3D project. Regional magazine of the year was won by Johnston Press for its etc title, while the best regional supplement went to The Journal for its Culture pullout. Gary Cullum, director of newsawards, said: “As this year’s awards testify, news publishing is tough and robust and has the resilience to ensure that it emerges strongly from recent structural and financial pain. Not much for JP to shout about after THE Yorkshire Post and Yorkshire Evening Post redesigns, plus the focus on quality. Very sad to see the ABC figures for a great newspaper like the Leicester Mercury. When I was circulation manager at the newspaper in the early eighties sales were 150,000 copies a day. Less than 40,000 copies a day now I am told. Don’t know which set of figures the judges were looking at for the EDP. Last time I checked they weren’t too impressive! JP where are you,Ashley its not working. Well done Boothy! Good job at Leicester!